Golden Freddy in YuGiOh card (FNAF). 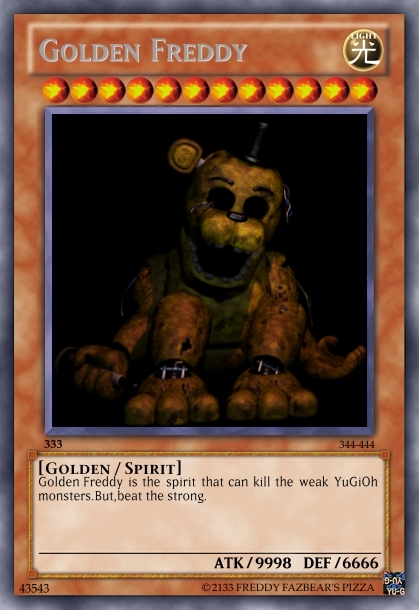 Yes,made by me.. Wallpaper and background images in the Five Nights at Freddy's club tagged: photo fnaf five nights at freddy's yugioh golden freddy card golden freddy. HOW DID YOU MAKE THAT?! You love fake YuGiOh cards?Or real?Or both? oh god, NO! PLEASE NO! THE MOST HOLY CARD EEEEEEVVVVVVEEEEEEERRRRRRRR!!!! !